Please note when using organic Shea butter. Shea butter cream will range from almost white to rich yellow. 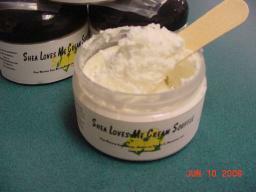 The Shea butter Cream is made in small batches stiried for over a hour for a thick creamy texture. Exclusive Shea Butter contains more than 25% Shea butter, along with other oils such as luxurious, moisturizing almond seed, cocoabutter,sunflower,vitamin E. Grapefruit seed. Addition fragrance available to match soaps. Just click other and add fragrance selection.